This post may contain affiliate links which help me run my blog. See more about that here. One of the strategies I am going to cover is how to get free products you use on an everyday basis, right from your local drugstore. Each week most drugstores will feature certain products for free. 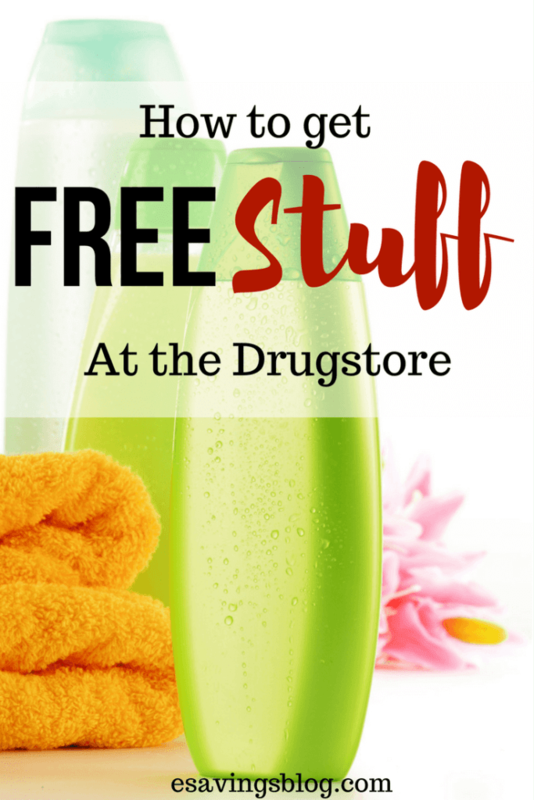 If you look at the sales flyer each week at your local drugstore, you will notice certain free items. CVS, Walgreens, Rite Aid and others will often have free (after rewards) items each week. You can stock up on toothpaste, mouthwash, cosmetics and all sorts of stuff for free; I have not bought toothpaste and mouthwash in years using this strategy! If you’re new to couponing be sure to sign up for my free learn to coupon e-course via the form above. So why would they give away products? They are using the loss leader strategy as you learned in the first section of The Free Stuff Series. The strategy for you would be to just buy the loss leader items. Since most areas have a drugstore on every other corner you are sure to be passing one on your way to work or in your daily travels so stopping in one to grab a free item should not be a problem or waste of gas. Plus if you’re picking up a prescription or maybe some milk (usually really cheap at CVS) than its convenient. How does this strategy work for you? The first thing you want to do is have your drugstore’s reward card because that’s how you will get the free products. The reward card is free at most drugstores and fast and easy to signup. The second thing you will want to do is to check out the weekly sales flyer either at the store or better yet use a smartphone app like Flipp to view the weekly ad right on your smartphone ahead of time. Look for your free items (I will show you examples below). Usually, the first item you buy, you will have to pay for upfront, unless you already have accumulated some rewards. First, look at your weekly drugstore ad online, in-store or in the newspaper. Look for items that will be FREE after rewards. For CVS it may say “FREE” after Extrabucks, Walgreens will say after Register Rewards or Balance Reward Points and Rite Aid will say after Plenti Rewards. You may not always see the word, “Free”; it may say something like “pay $3.99 for Crest and get $3.99 back in rewards” so look for that difference in wording. 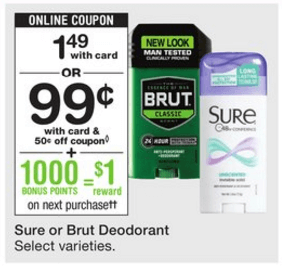 For the $3.99 example, you would spend $3.99 plus tax upfront and get $3.99 back on your receipt as a coupon or extrabucks (for CVS) or Points/Register Rewards for Walgreens and Plenti Points for Rite Aid. Then you will go and use the $3.99 you get back from that purchase to buy another item that gives rewards back so then you will get them free. For example, sometimes there is a limit of two on these deals. You would buy the first one and then use the $3.99 you get back in rewards to buy the second one so that you will pay nothing out of pocket but the tax on your second item. Plus you will get another $3.99 back on that item you just paid nothing for! 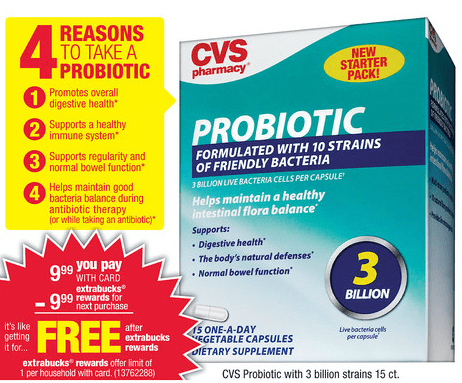 Take a look at the picture below of a CVS advertisement and an example of a FREE item. This Item has a Limit of 1 as you can see from the very small print at the bottom. So you would pay $8.99 and get $8.99 back in Extrabuck rewards that can be used on anything at CVS! If you had a coupon on this item, you would pay less and then still get $8.99 back! So say you had a $2 off coupon, You would pay $6.99 and get $8.99 back! 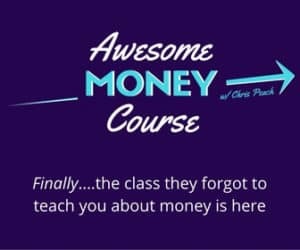 You just made money! You can keep track of what you bought and the limits at the bottom of your receipt. Remember you must scan your CVS Extracare card at the time of your purchase. Here are two examples of what it will look like at RiteAid and Walgreens. You can also search the coupon database to see if there are any other coupons out there. I have seen $1 off coupons plenty of times for this product. In this example, depending on what coupon you had you would either pay 0.25 for this deodorant or get it free and make 0.25 on it! 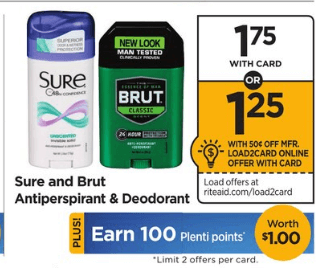 Plus there is a limit of 2 so if you had two coupons you could get two free deodorants! You can find out more about Rite Aid Plenti Points here. 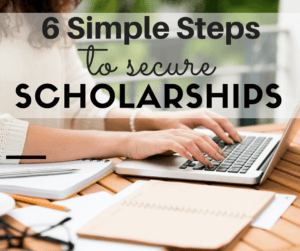 You can find out more about Walgreens and how their balance reward points work here. I just showed you how you could actually make money by combining coupons with already free items, but now I am going to show you how to make items free by using coupons. As you are looking through your weekly sales ad, some items might not appear free at first, but if you combine them with a store or manufacturer coupon, they will be. For example, if the $3.99 toothpaste only gave $2.99 in rewards back, you could use a $1 off toothpaste coupon which would bring it down to $2.99 at the register, you would get $2.99 back in rewards resulting in it being free. Are you still following?? Not sure if there are coupons out for the item you want to buy? Make sure you check out the coupon database. In some instances, you may get an instant freebie after coupons without having to use or earn any rewards or points. For example, every time you go into CVS you want to scan your card at the CVS Coupon Machine (see picture below). 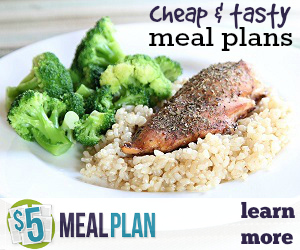 These coupons are CVS coupons and can be combined with manufacturer coupons to score free and discounted items. 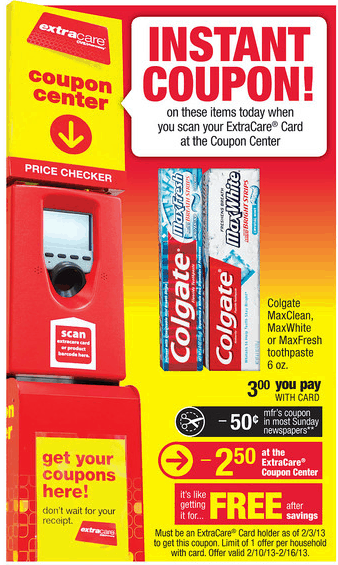 In the example below the coupon machine prints out a coupon for $2.50 and there is a coupon for 50 cents in the paper which will make this Colgate toothpaste FREE! So nothing out of pocket! If all of this seems overwhelming to you or confusing, coupon bloggers make it easy for you because each week they will list what is FREE at each of these stores! I may start posting coupon matchups again in the future if my readers want them (let me know in the comments, and if I get enough interest I will post weekly Free Stuff Matchups) but until then, I will share with you some of my favorite coupon bloggers in just a bit. Not sure what a coupon matchup is? Below is an example of a coupon matchup for CVS and how it would look on a coupon bloggers website. In the weekly coupon matchups, it will show you the sale price, the amount of rewards you get and what coupons to use to get it for free. 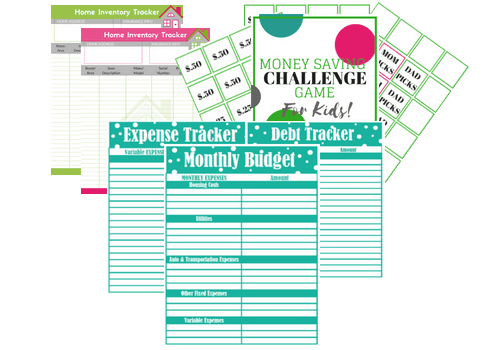 Some of my favorite coupon blogs are Living Rich With Coupons and Money Saving Mom who posts weekly coupons matchups, just click on the store name and you will get the coupon matchups. You can learn more about how to shop at CVS on our CVS Shopping page. Rite Aid and Walgreens have similar reward programs, and you can find out more about them on the Walgreens and Rite Aid websites. If you want more examples from any of these retailers or if you have questions, please leave a comment on this post, and I will answer it as quickly as I can. Thank you for reading part of the FREE Stuff Series and be sure to share this post with your friends. Has this series helped you? Let me know in the comments below and feel free to share this post via the share buttons above and below this post.